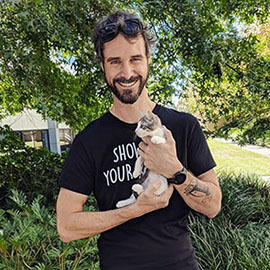 We are a group of dedicated volunteers who rescue, foster and re-home animals that find themselves without a home, often sick and in desperate need of love. We believe every animal deserves the right to be cared for and loved. We do not discriminate between young or old, pregnant or sick, they all deserve their freedom and our help. Sparky is a beautiful boy who is very confident and loves to show off his good looks as much as possible. Give him a catwalk and we are sure he'll happily strut down it to show them off ! Sparky loves to smooch his humans and wind himself around their legs but cuddles are always on his terms as there's always something for him to explore or new legs to wind himself around. Sparky could play with toys for days as well as try and push the boundaries by pinching some of Sweety's or his foster siblings dinner ! Sparky came into care with his sister Sweety as a bonded pair as their own had passed away and they were taken to the vet to be put to sleep . Thankfully the vet talked the temporary owner to surrender them instead. 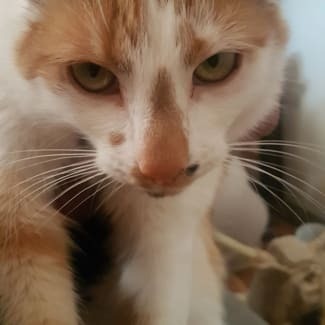 Sparky is now used to co-living with his foster siblings but would much prefer a home where Sweety and himself are the only cats. 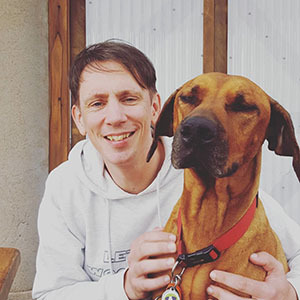 He is also used to living the calm , gentle dogs. Sparky is an energiser kitty , always exploring , playing and being affectionate with his humans. Sparky and Sweety are so deserving of loving home for their 2nd chance and we hope that your family will be the one to give it to them . Please note : Adoption fee is a suggested donation of $50 upwards for the pair to our rescue. We are very keen to get Sparky and Sweety into the right loving home and want to give them every chance to achieve this. Sweety is just as her name suggests. She is a beautiful girl with a very sweet nature. Sweety loves to play with her toys and her brother Sparky. She loves to have a chat with her humans and when it is meal time she absolutely loves to oversee the food going into everyone's bowl to make sure everyone gets equal amounts! Sweety first came into care with her brother Sparky as a bonded pair. Sweety first came into care with her brother Sparky as a bonded pair as their own had passed away and they were taken to the vet to be put to sleep . Thankfully the vet talked the temporary owner to surrender them instead. 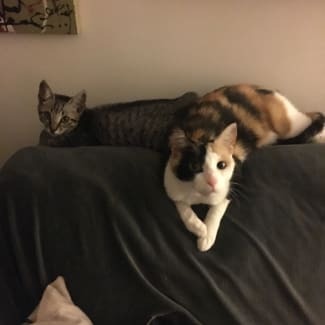 Sweety is now used to co-living with her foster siblings but would much prefer a home where Sparky and herself are the only cats. She is also used to living the calm , gentle dogs.Sweety and Sparky are so deserving of loving home for their 2nd chance and we hope that your family will be the one to give it to them . Please note : Adoption fee is a suggested donation of $50 upwards for the pair to our rescue. We are very keen to get Sweety and Sparky into the right loving home and want to give them every chance to achieve this. Raven has been in his foster home for over 12 months now and we think it may be time to pack his little bags and leave home. We are offering Raven for foster care with a view to adoption. A great way to trial . 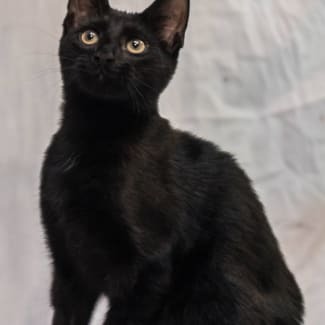 Raven would make a great furry companion for a family or a person who lives alone and would like a quiet little boy who loves a good play to share their day. Here are some more details about Raven. Handsome Raven is a quiet little boy who loves dashing about the place. He is very interested in pats loves being stroked and is super interested in fuzzy things on sticks. Raven is currently in foster care with his mum and other siblings. He has grown up around dogs, other cats and small children. He will just need time and love to help him come out of his shell. Raven would be perfect for a family who is prepared to let him settle at his own place and give him lots of pats and play to show him how much fun humans can be ! 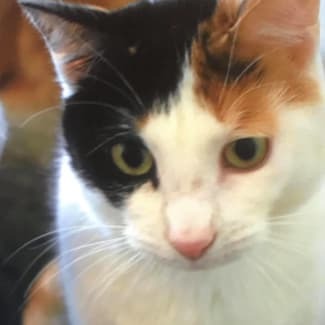 Callie is a sweet affectionate girl who came to us after her owner decided she couldnt look after her anymore and was going to have her euthanised. Callie loves to play , explore ,but most of all loves to rub around your legs , smooch you and show you lots of love. 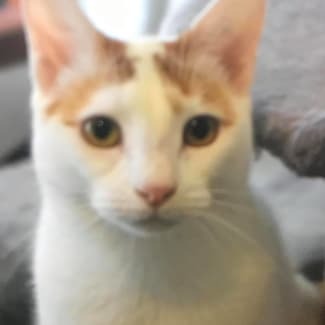 Callie is not used to other cats so would be better in a single cat household, but with a slow introduction we think she would be ok . She is not used to dogs or children but once again with patience, we think she would be ok . She is currently an indoor cat but has been outdoor supervised. A cat enclosure with lots of stimulation would be something she would also enjoy. Callie would make a super companion for someone who is home a lot and is after a super affectionate kitty. Once you meet Callie we are sure you will fall in love with her and her with you !